(From left) Alex Lim Eng Kang, Head of Group Retail Distribution, RHB Banking Group; Badrul Hisham Abdullah, Head of Retail Deposits, RHB Banking Group; Mr Chin Cher Chau, second prize winner of a Mercedes-Benz A-Class worth RM208,888; Ms Wong Sooi Fun, grand prize winner of a Mercedes-Benz E-Class worth RM348,888; Nazri Othman, Acting Head of Group Retail Banking, RHB Banking Group; and Abdul Sani Abdul Murad, Group Chief Marketing Officer, RHB Banking Group; at the “Save The Cash, Win The Car” campaign prize giving ceremony held at NZ Wheels Sdn Bhd at Bangsar Baru today. 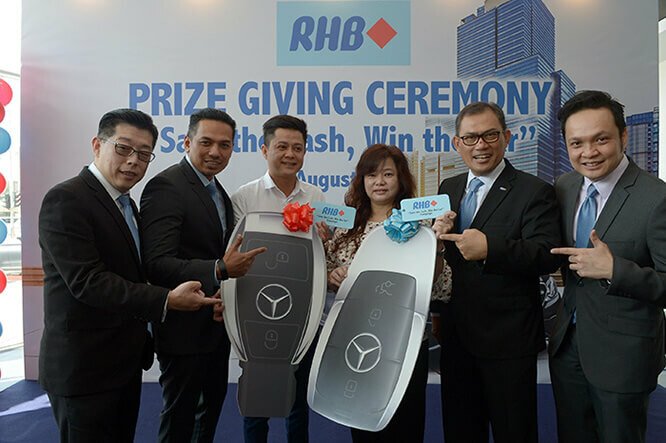 KUALA LUMPUR (Aug 28): Two lucky winners of RHB Bank Bhd's 'Save The Cash, Win The Car' campaign went home with two luxury cars worth RM560,000. The winners are Wong Sooi Fun from Sg Petani, Kedah, who took home the grand prize of a Mercedes-Benz E-Class worth RM348,888. Chin Cher Chau from Kulai, Johor, took the second prize of a Mercedes-Benz A-Class worth RM208,888. In the four-month deposit campaign that ran from Aug 15 to Dec 14 last year for all new and existing RHB current and savings account holders, RM1.3 million worth of prizes were won by about 1,000 contest winners, RHB Bank said in a statement today. Customers who made deposits of a minimum RM25,000 into their RHB CASA account, earned contest entries to be in the running for the grand or second prizes, while those that deposited a minimum of RM100,000 were rewarded with electrical appliances. RHB has launched the second wave of its deposit campaign for the second half of this year, dubbed the “RHB Debit Card G-Shock Campaign”, which runs from June 1 to Sept 30, while its “RHB Deposit Luxury Watch Campaign" runs from July 18 to Oct 17. “RHB will continue to strive to offer our customers more value-added offerings and attractive rewards. At the same time, we want to be a preferred financial partner for our customers, as they aim to achieve their financial goals,” said RHB Banking Group's acting head of retail banking Nazri Othman.